You are here: Home / Get Profits / Don’t Go It Alone – Partners Help You Climb Higher! 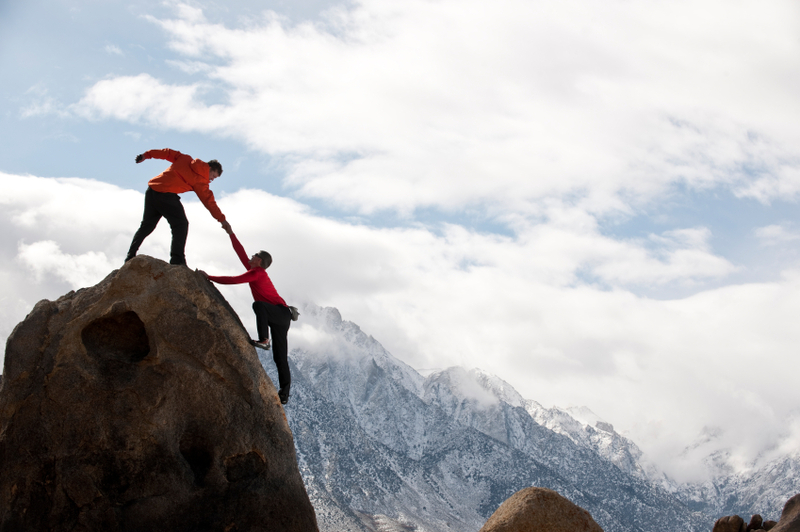 Don’t Go It Alone – Partners Help You Climb Higher! If you run a business, you know how essential it is to regularly monitor and measure the vital signs of your business, such as sales, profits, and project milestones. No matter your size, very simple processes can be put into place in a few key operational areas which can scale and grow in complexity as your business grows. But for me, it is not just the structure of processes which creates the framework for accountability – it is the key people and partnerships which keep me on track and help give life to the creative ideas that may otherwise be stuck in the “what if?” file in my mind. Mastermind Team: I am in a group of 6 fellow business owners (4 original members) which has been meeting semi-monthly for almost 10 years. Initially begun as a group of ex-colleagues meeting to stay in touch, we became a formalized group with a structured agenda. All of us are entrepreneurial moms who work from home and have found that meeting regularly, declaring our goals, sharing our successes and struggles helps us to develop and maintain strong individual businesses (and balanced lives). Each of us began this journey with different corporate and life experiences only adding to the richness of the collective – synergy, if you will. Coach/Mentor: Anne is a powerhouse sales executive who I was lucky enough to meet in my early 20’s when she took me under her wing. Initially supporting me as I navigated the corporate rat race, she was the first person to encourage me to become a coach and consultant and remains the person I can call for counsel with “I have this idea. What do you think?” Anytime, any day, she gives it to me straight. Virtual Communities: I have been joining online communities and forums since the start of my business. There are so many amazing communities focused on small business and niche topics. Recently, I joined two new membership forums (ProBlogger and Third Tribe) focused on blogging and internet marketing, communities focused upon skills I am developing in support of my business strategy. In both cases, I was looking for the support of others who have “been there, done that” because I wanted to learn from the best. Communities provide a place of mutual support for entrepreneurs like me to declare tactical goals and check back with progress and feedback on work in progress in a positive learning community. Each Accountability Partners fills a different place in my life and business and I take the responsibility for my role in the partnership very seriously. 1. Respect time. Whether paying a fee or not, show up when you say you are going to show up. 2. Respect the commitment. Do homework and follow through on your promises. Respect yourself and the process enough to invest time outside of the scheduled meetings. 3. Give – as much and as often as you can. Everyone wants to know you value their contribution to your business. Even in a mentor partnership, the mentor appreciates a word, a card, a written recommendation, a referral, a small token of appreciation. Yes, even the truly altruistic are grateful for appreciation – we all want to know our lives mean something to others. Do you have Accountability Partners? How do you make the relationships successful?